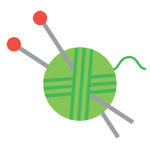 Join the Wednesday night "Knit and Purl" gathering! Attendees should bring their own supplies, but we have needles and yarn on hand for beginners to practice. Contact the Cherrydale Branch Library at 703-228-6330 for more information.